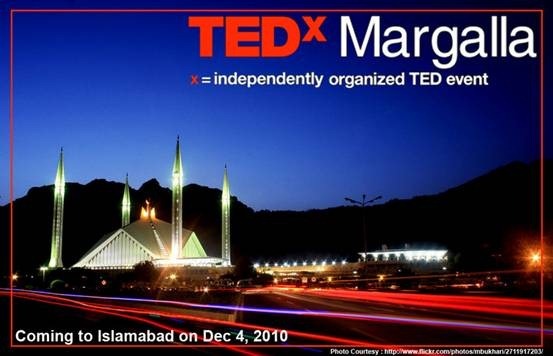 Ladies and Gentlemen: Gear up as the first TEDx Event is coming to Islamabad on Dec 4, 2010 and it's going to be an evening all about technology, entertainment, design, art, creativity, innovation and inspiration. 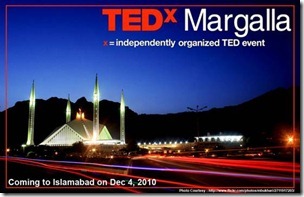 To attend the TEDxMargalla session, head over to http://tedxmargalla.com/register and fill out the registration form. All selected attendees will be informed after Nov 20. The event will also be livestreamed around the world so don't miss the chance to be a part of this exhilarating experience.